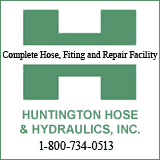 HUNTINGTON, WV (HNN) - Quarterback A.J. 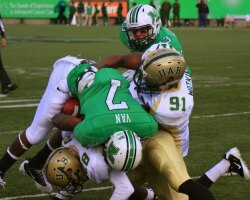 Graham threw for five touchdown passes, four in the first half as the Marshall Thundering Herd easily bested the UAB Blazers 59-14 in front of 20,735 fans at Joan C. Edwards Stadium. Graham connected on 19-of-27 passes for 239 yards. Marshall took the opening kickoff and drove 54 yards in five plays capped off by a 16 yard pass from Graham to Troy Evans. A 26 yard Tyler Warner field goal put the Herd up 10-0 with 3:22 remaining in the first quarter. A 28 point second quarter barrage put the game away for good. First Graham connected with Gator Hoskins on a three yard TD strike, and then Omar Brown intercepted a pass and returned it 48 yards for a score. Eric Frohnhapfel caught Graham’s third touchdown strike this time from three yards out. Graham’s fourth touchdown pass came when he hit Aaron Dobson on a 23 yard touchdown pass with 4:46 left in the first half. Curry finished the game with 7.5 tackles with a sack and three forced fumbles. The Herd’s final score came when backup quarterback Rakeem Cato hit Gator Hoskins on a 34 yard TD pass with 10:59 left in the game.